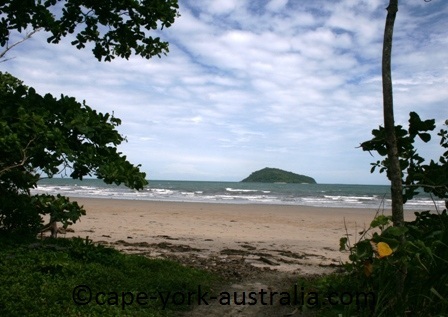 The Cape Tribulation area is north of Daintree river. It is in the northern Daintree rainforests, and it is most often referred to as the whole area north of Daintree River Ferry and south of the southern end of Bloomfield Road. 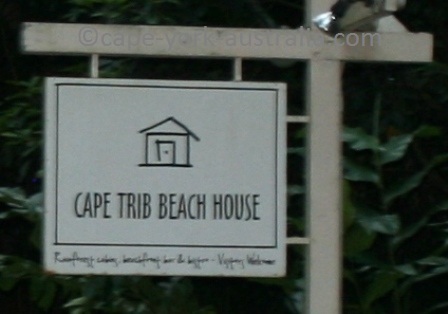 But the actual Cape Tribulation Village is in the northern end of the whole area, which also includes other places like Cape Kimberley, Cow Bay, Alexandra Bay, Thornton Beach, Noah Beach and more. And the actual Cape is even further north, where you can walk to the lookout point called Kulki. For years I used to come here and just do the Mangrove Walk to the beach and there seemed to be not much else around. Now, the place is heavily commercialised and packed with different kinds of accommodation, tour companies and places to eat and drink. If you come here with expectations of pristine tropical rainforest, bear in mind that it doesn't come without mass tourism here, not anymore. But the rainforest and the beaches are still beautiful. There are a few rainforest boardwalks where you can experience the rainforest. There is also the Daintree Discovery Centre where you can learn about it, as well as a bat house, an insect museum, and a few tea, coffee and tropical fruit farms that you can visit. The rainforest itself is of course beautiful - there is a reason why Daintree is the most famous tropical rainforest in Australia. You can have a closer look at it on the many boardwalks in the area, and go spotlighting night time to see its nocturnal animals. But rainforests mean just that - it's raining a lot of the time and for years my photos of the place were all dull because the sun was never out when I visited. It is not a nice type of weather, but without the rain, there would be no rainforests. Accommodation is plentiful - there are beach houses, lodges, resorts and spas, rainforest bungalows, backpackers, farmstays and camping grounds. And there are many different places of bed and breakfast accommodation. 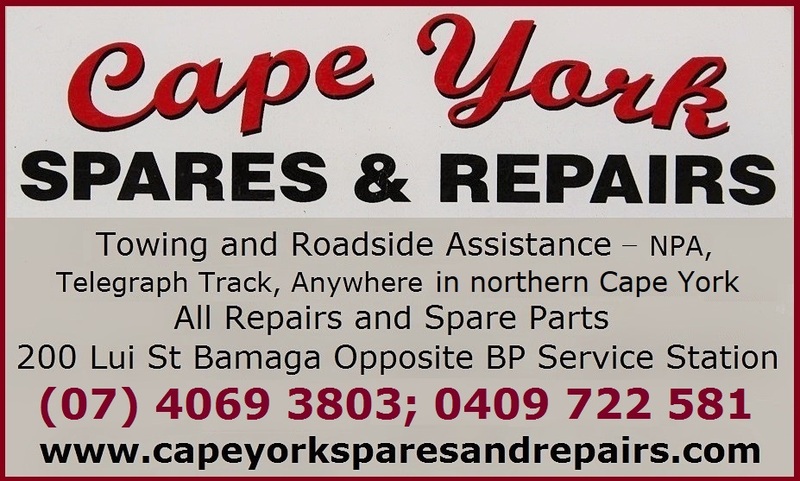 But if you are on your way up to Cape York, you are likely looking for a camping ground. 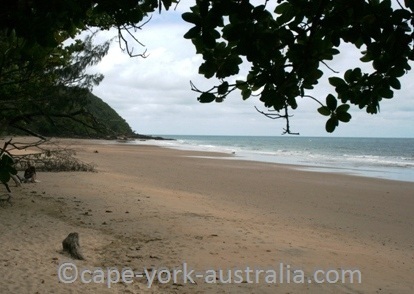 There is one south of the Cape Tribulation Village, and there is a national parks camping ground at Noah Beach. Many accommodation places also have camping grounds. There are many places to eat out. 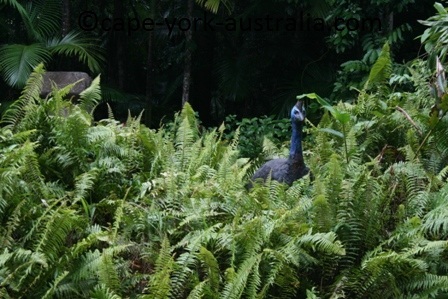 A good one is Whet just south of the Cape Tribulation Village. There is also a good one at Mason's Shop, and there are a few places at Thornton Beach and Coconut Beach. Many accommodation places have restaurants; and there is a pub in Cow Bay. There are lots of different tour operators. There are jungle walking tours, four wheel drive trips, river cruises, croc spotting, horse riding, white water rafting, and ocean safaris that take you out to coral reef. And there are tours from Cairns that take you here. Do you need a four wheel drive for your Cape Tribulation trip? If you only do the usual thing like most people do, you don't need it. The road is all sealed and good. 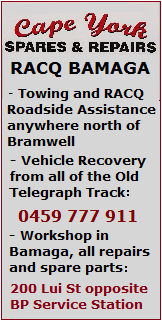 But if you want to get off the main track and venture into Bloomfield Road or other small tracks, you do need a 4WD vehicle. 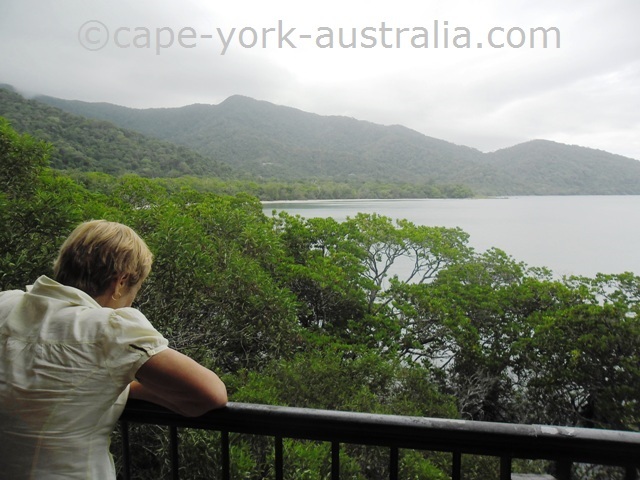 I have seen a lot of people coming here with loads of expectations, having heard so much about the place and the famous Daintree rainforests. So when they arrive and drive through the area, which only takes about half an hour, they are immediately disappointed. What you have to do is to slow down and enjoy the place. Find yourself somewhere to stay for starters, then go out and start discovering in slow pace. 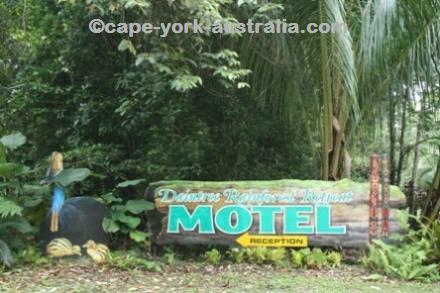 Once you have crossed the river on the ferry, and keep driving north, you first pass a left-hand turnoff to Daintree Manor B&B and Daintree Forest Trails. Keep driving and you come to the right-hand turnoff to Cape Kimberley - a beautiful beach spot, and there is a beach house accommodation. Back on the main road, the next thing north is a nice lookout point. 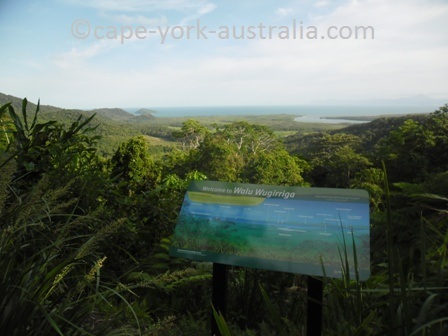 Have a closer look and you can see Cape Kimberley and Snapper Island, the mouth of Daintree River, you can see Port Douglas and Low Isles, Wonga Beach, and even as far south as Double Island, which is not far from Cairns. 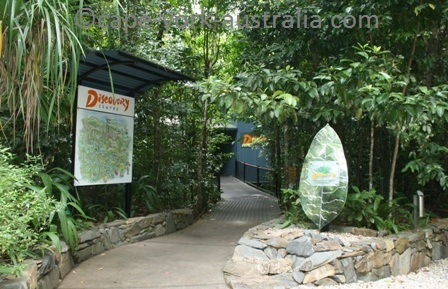 Not far from the lookout point is Daintree Discovery Centre. If you haven't been to a tree top walk and are interested in learning about the amazing rainforest ecosystem, this is a great place to do it. It is very informative with both plants and animals. 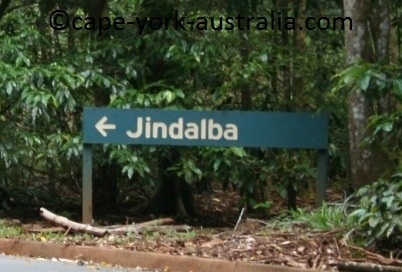 Just next door from the Discovery Centre is Jindalba Boardwalk - the southernmost one of a few different rainforest boardwalks in Cape Tribulation. 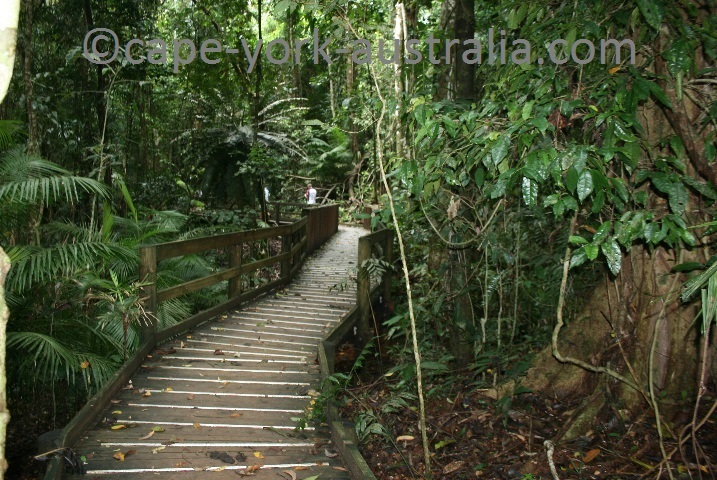 It is also one of the best ones and a great place to take some rainforest photos. Further north is Cow Bay, which is really a little township (by the way, the largest one in the area), with a hotel (pub), car mechanics and even an airstrip. 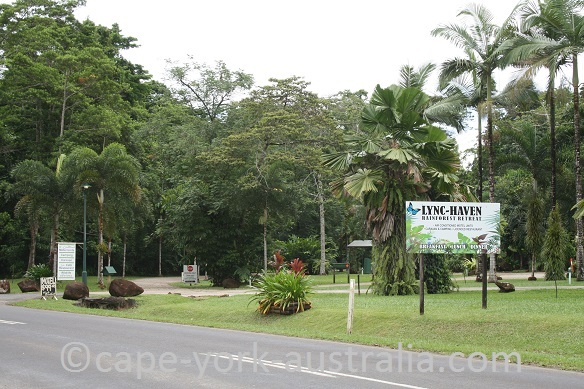 Turn right to the beach and a road takes you past a few accommodation places to Cow Bay Beach with a nice picnic area. 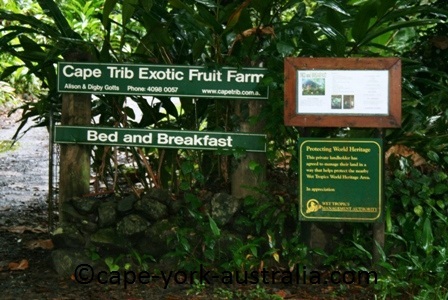 Cape Tribulation is also known for its farms. 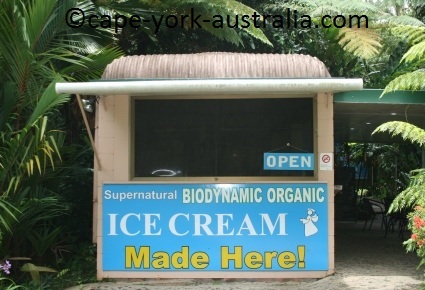 There are a few tea, coffee and tropical fruit farms, which are open to the public and you can of course buy the locally grown tea, coffee, tropical fruit, and ice cream made from the locally grown tropical fruit :-) Some are found in Cow Bay. Just north of Cow Bay you can turn in to Hutchinson Creek, and further north to Wilderness Lodge where there is a cafe and a fan palm boardwalk. 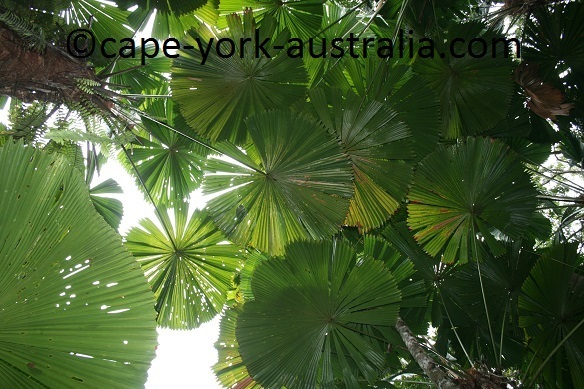 Fan palms are some of the most beautiful rainforest plants and this is one of the best places to see them. 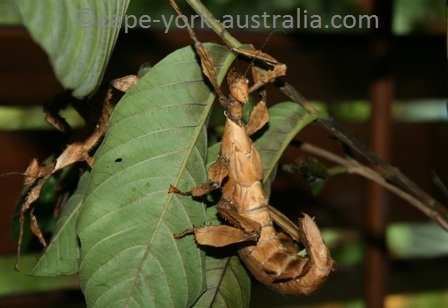 Further north you pass the Daintree Tea Company and a few accommodation places, before you get to the turnoff to the Insect Museum - an amazing collection of different types of insects from the area as well as other places in the world. If you are even slightly interested in wildlife, drop in! After the insect museum you cross Cooper Creek where you can join some tours; and then you come to Thornton Beach. It's a nice beach for a walk, but like other beaches up here, not so good for a swim due to sharks, jellyfish and crocodiles. There is beachfront dining in Cafe of Sea. North of Thornton Beach you cross Noah Creek, and then there is Marrdja Boardwalk - another rainforest walk. 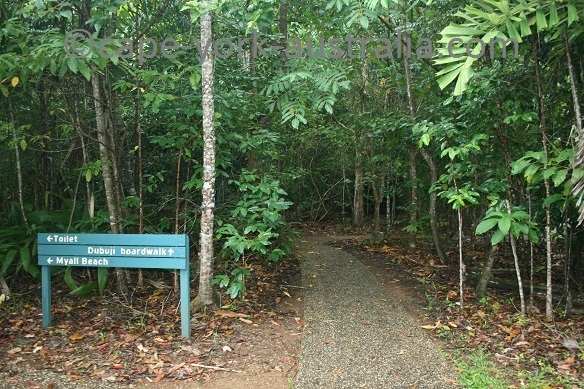 This walk doesn't only take you through rainforest, but also a quite extensive mangrove area. It is quite interesting and there is information to read about mangrove habitat. Further north you cross Oliver Creek and come to Noah Beach - where there is a camping ground. The camping spots are behind some vegetation but next to the beach and it's also a nice place to go spotlighting night time. 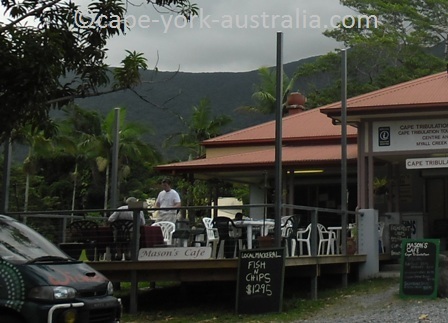 After Noah Beach you cross Thompson and Myall Creeks and on your left hand side is Mason's Store - where there is a nice cafe and a small grocery shop. 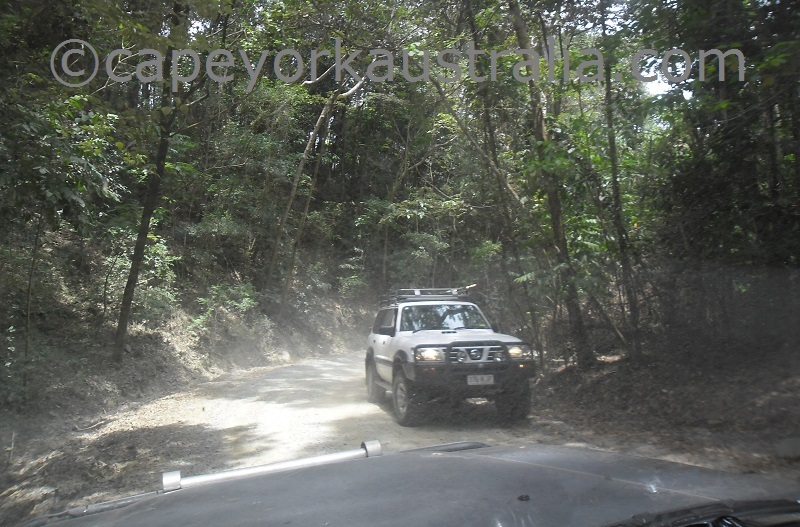 They also run four wheel drive tours to Bloomfield Track which is the road north towards Cooktown. 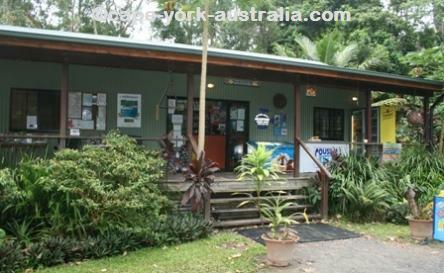 Further north is Cape Tribulation Camping Ground, which is very nice, has a lot of space, nice amenities, a small shop and nice staff, but is not a really cheap place to camp. They also have kayak hire. Just north is Myall Beach and Dubuji Boardwalk. 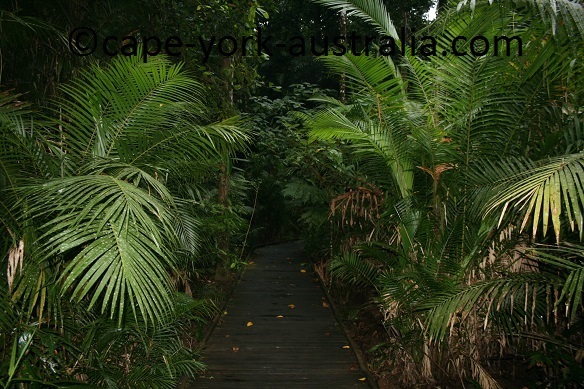 This is another rainforest boardwalk, but each one is a bit different. Dubuji is perfect if you want to combine a rainforest walk with a picnic lunch or barbeque - there is a large picnic area. 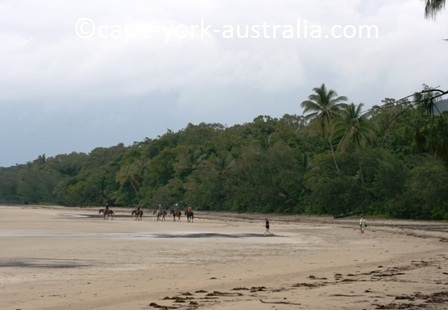 This walk also goes to the beach, crosses a creek and passes through an area with mangroves and fan palms. Across the road is Camelot Close - a street with a few accommodation places, and Nicole Drive - another street where you can visit an exotic fruit farm and taste locally grown tropical fruits from Asia, Caribbean and South America. Back on the main street, just north is the Cape Tribulation Pharmacy and grocery shop, the main stop for tour buses, and PK's Backpacker Accommodation. There is also the Turtle Rock Cafe and Takeaway, and the Mangrove Boardwalk - a short stroll to the beach through a mangrove habitat. Across the road is Bat House. There is only one bat, but it is not the Little Red Flying Fox or Black Flying Fox, that you can see in many parts of northern Australia. It's the Spectacled Flying Fox, which is only found in parts of eastern Cape York peninsula, including Daintree rainforest. 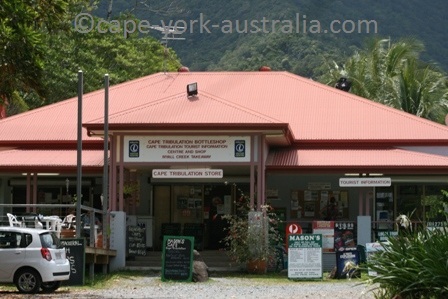 The Cape Tribulation Village is finished with the Bat House, and the only thing you have left is the actual Cape Tribulation - the cape that has given the name to the whole area. It is called Kulki by local Aboriginal people, and you can reach it by walking through the rainforest to the beach and a lookout point. 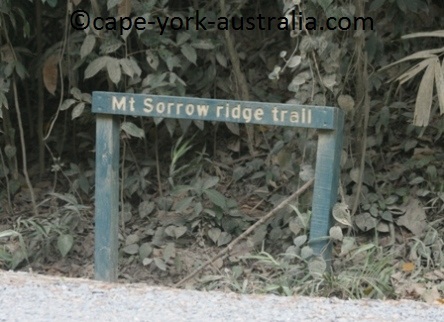 There is one more thing, but only if you are fit and into serious bushwalking. North of Kulki is a small car park and across the road is the start of Mt Sorrow Track - a steep and hard (by most people's standards) hike up to Mt Sorrow. This is the end of Cape Tribulation and the start of Bloomfield Road. 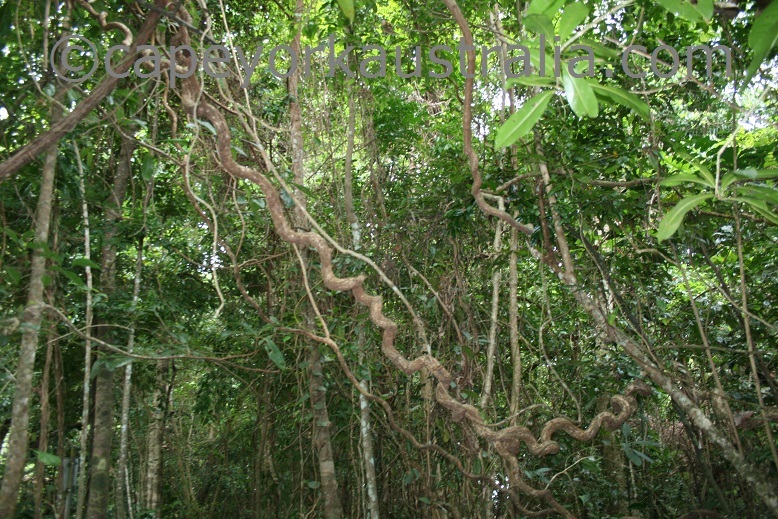 Cape Tribulation rainforest is the oldest rainforest in the world. It is really dense and lush, and it has so many different species that it is known as the most important living record of Australian plants’ and animals’ evolution over 400 million years. While the rainforest is all around you in Cape Tribulation, there are a few places where you can walk on boardwalks to get into the rainforest to experience it even better. The best places are Dubuji, Marrdja and Jindalba Boardwalks, but you can also walk in the Cape Tribulation rainforest on the Kulki, the Fan Palms, and the Mangrove Boardwalk. Dubuji is the northernmost one, and it starts just south of the Cape Tribulation Village. It is a nice walk that crosses a creek and goes to a beach. It also passes though an area with mangroves and fan palms. There are large picnic grounds at the start of this walk. Marrdja is the next one south, and it starts south of the national parks camping ground at Noah Beach. 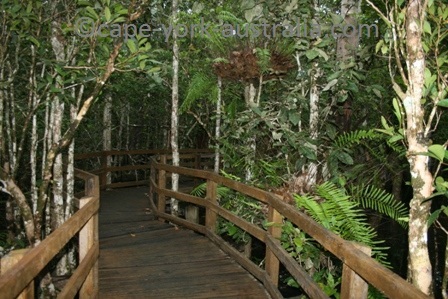 The walk goes through some beautiful tropical rainforest as well as quite an extensive mangrove area. Further south, just north of Cow Bay is the Fan Palm Walk adjacent to a wilderness lodge. 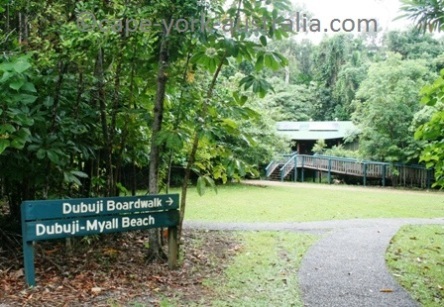 And south of Cow Bay is Jindalba Boardwalk next to Daintree Discovery Centre where you can learn all about Daintree rainforest. 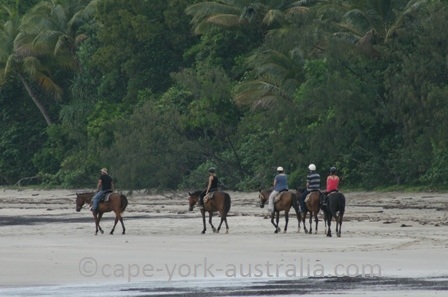 There are many different Cape Tribulation tours available. 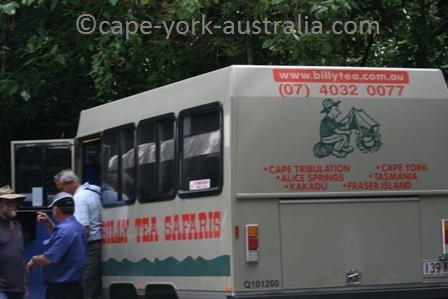 Some are local tours in Cape Tribulation, others depart from Cairns, Port Douglas and Cairns northern beaches. It is always cheaper to rent a car and do the drive yourself, but a tour is handy if you like to sit back and be taken to places. They all take you to great places, so it surely is an easy way to have a great day. Some four wheel drive tours take you to tracks in the Daintree rainforest as well as to Bloomfield Road. You can also go horse riding, white water rafting, or join a croc spotting or guided rainforest walking tour or take a trip out to the Great Barrier Reef. 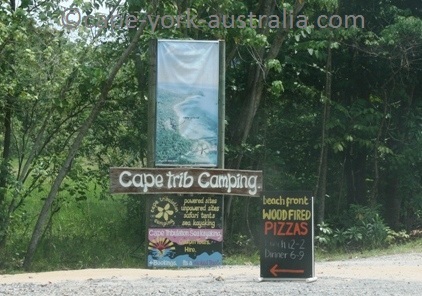 There are a few Cape Tribulation camping grounds. 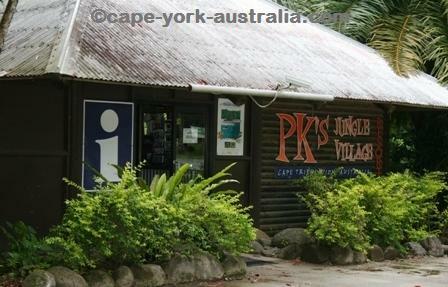 While there is a lot of different accommodation available in Cape Tribulation, if you are on the way up to or down from Cape York, you are most likely looking for somewhere to camp. And there are a fair few options around in the area. 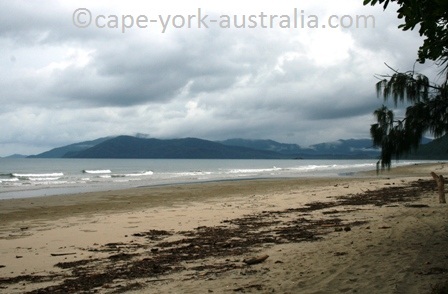 The northernmost one is the Cape Tribulation Camping Ground. It is a nice place with large open camping sites and clean amenities, but it is not your cheapest option. A lot of the accommodation places have camping grounds in their back yards, and they can be quite cheap even if their cabins and rooms are expensive. Lync Haven has quite a cheap camping ground. But your cheapest option is the national parks camping ground at Noah Beach. National Parks Camping Gound at Noah Beach. 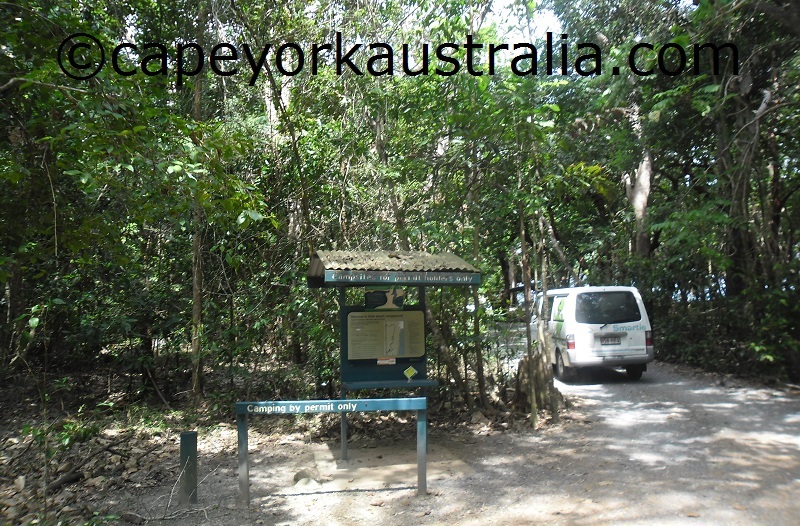 It is a nice shady camping ground just next to the beach, under large trees where it may well be worth doing some night time spotlighting. 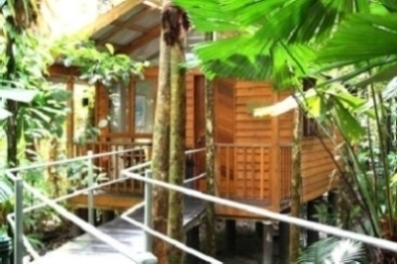 There is a lot of Cape Tribulation accommodation to choose from. 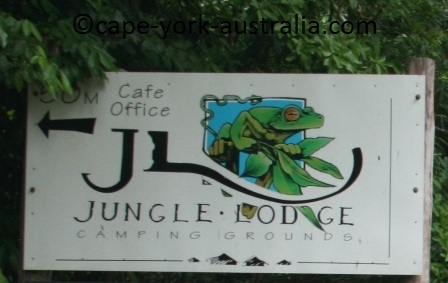 As you drive through Cape Tribulation, along the main road, you pass by accommodation all the time, it's absolutely packed with resorts, lodges, hostels, bed and breakfast.. There are obviously a lot of rainforest locals here who like to make a living from it - and the places to stay are beautiful. Below are some, roughly from south to north. This motel has a variety of different rooms with tea and coffee making facilities, fridges, toasters, microwave ovens, TVs, work desks, insect screens and private bathrooms. There is an outdoor saltwater swimming pool, a snack bar and a BBQ area if you want to cook yourself. This retreat, near Cow Bay, has three bedrooms and two bathrooms and sleeps nine guests. There is a well equipped kitchen, TV, stereo, CD and DVD player and internet access. There is an outdoor swimming pool with showers and an entertainment area with BBQs. And a library and undercover parking. This lodge has only seven cabins to be able to give more personalised service. Cabins have tea and coffee making facilities, TVs, CD and DVD players, mini bars, internet and room service. There is an outdoor swimming pool, a massage and beauty centre, a bar and a restaurant. This lodge is inland from Thornton Beach. It has cabin style accommodation with mini bars, coffee and tea makers, TVs, DVD players, internet and in-room movies. 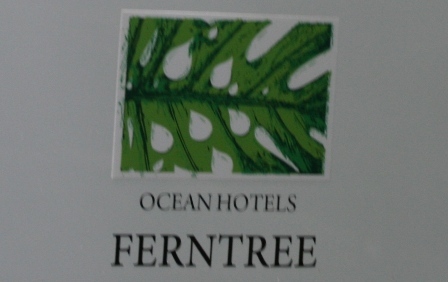 There is laundry service, free parking, a swimming pool, a spa, massage, a bar and a restaurant. This resort has villa style accommodation with rainforest rooms that have tea and coffee making facilities, mini bars, TVs, CD players and room service. There is a swimming pool, a spa, laundry service, babysitting, a bar and a restaurant. This lodge has rooms with minibars, coffee and tea making facilities, direct dial phones, room service, private bathrooms and balconies. There is a pool, a spa, a fitness room, a library, a bar and a restaurant. Free airport shuttle and free breakfast every morning. 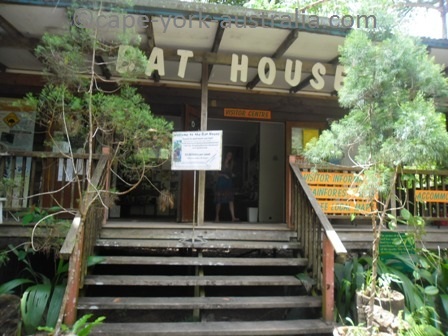 This lodge is a 104-bed backpackers hostel that has dorm rooms and private cabins. 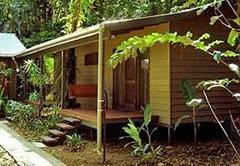 The cabins are very nice with air conditioning, mini fridges, ensuite bathrooms and private balconies. There is a swimming pool, laundry, communal kitchen, TV lounge and BBQs. 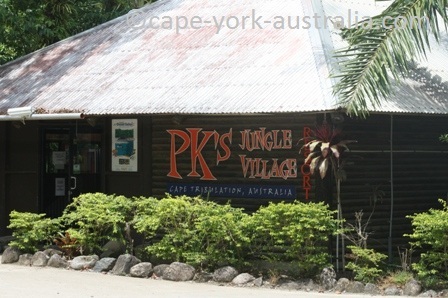 This is a backpackers place with triple share jungle tents, double and twin safari tents and powered camp sites. Tents have shady decks; and on the grounds there is a communal kitchen, a camp fire area, laundry, parking and other usual amenities. This bed and breakfast place has two timber cabins for one couple each. 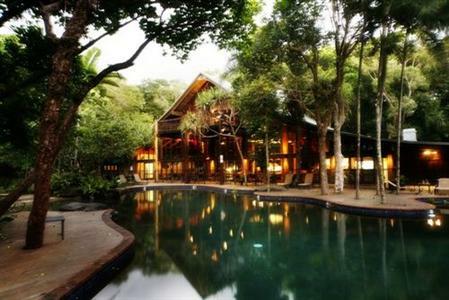 There is a kitchen, a lounge and a large verandah with rainforest views. In the lush tropical rainforest gardens there is a fish pond and some quite fantastic sculptures. This is another backpacker place and it's just next door to the IGA supermarket. There are cabins as well as powered and unpowered camping sites. Amenities block, large open communal kitchen and a lively bar. 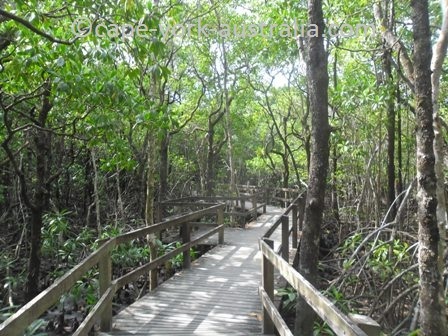 In the end of camping grounds there is beach access via a mangrove boardwalk. 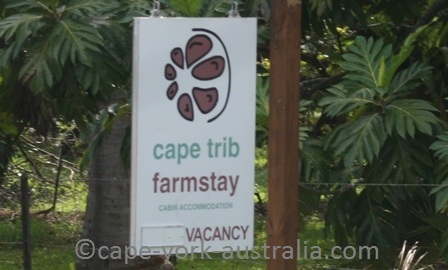 This place is on a tropical fruit farm in the heart of Cape Tribulation and it has bed and breakfast accommodation. There are cabins with insect screens, private ensuite bathrooms and verandas with mountain views. Kitchen and laundry facilities are shared. 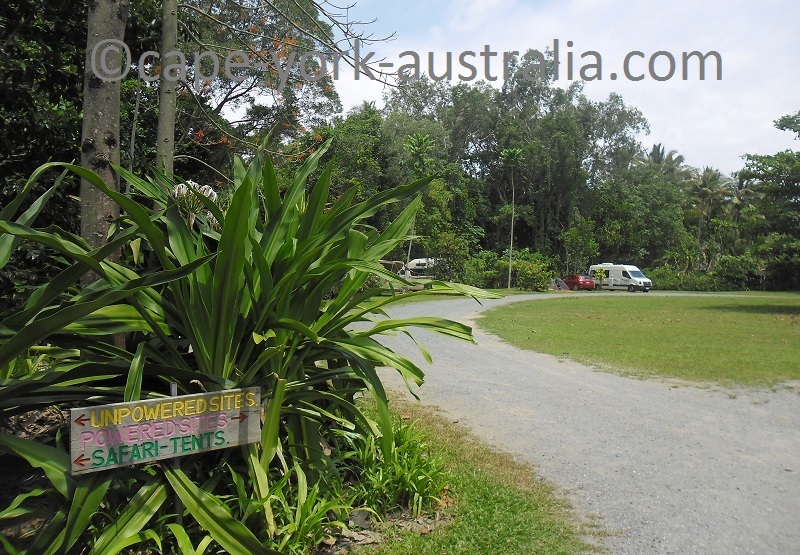 This is a nice camping ground that caters for tents, caravans, motor homes and camper trailers. There are 20 powered and 40 unpowered sites, and double and twin safari tents. There are all camping amenities including a fully equipped camp kitchen and BBQs. 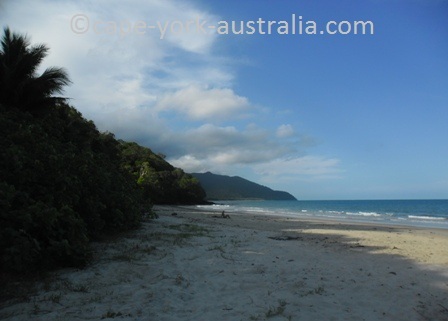 In the northern end of Cape Tribulation, this place is on a seven acre rainforest block with beachfront. There are self contained apartments as well as family cabins and budget dorms, and amenities vary depending on the kind of unit. There is a swimming pool, off street parking and a bar and a restaurant. 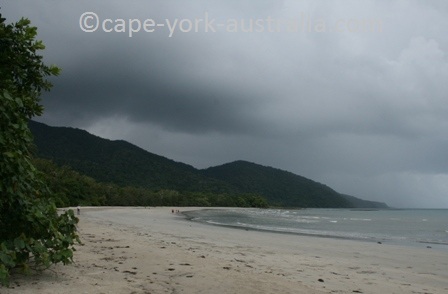 What is Cape Tribulation weather like? Well as you would expect in the rainforest, it often rains. They do have their sunny days, particularly during the dry season, but most of the time that I have visited, it has rained. The temperatures are warm and tropical all year around. The hottest time is November - December, before the monsoonal rains roll in. Those bring an almost constant cloud cover, which cool the temps down, despite the fact that January and February are summer months in southern Australia. The monsoonal Wet season lasts until April - May, and is followed by the Dry that lasts until the end of the year. For more general information about the climate of the area, read about the northern Australian climate. Below is where you can check the current weather in Cape Tribulation, and in fact anywhere else in the world. Just type in the location or post code ond click on 'go'. (Note that it sometimes just picks the closest weather station, so there may be a different name, it's still the weather of the area).